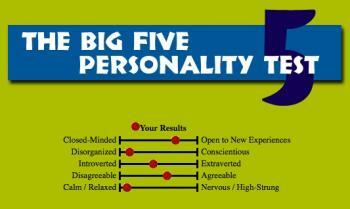 OCEAN (Big Five) is by far the most evidenced-based personality trait model available today. It has been studied by psychologists for decades, and each of the five traits it proposes has been independently rediscovered via statistical surveys in large samples of people. This doesn’t mean the model is perfect. For example, it may be missing additional traits, as we will see. But it is a great starter tool to find stable aspects of your personality, and test them again in five years and see how stable they really are. A free 25 question version is available at Psychology Today’s site. Where do you fall on each of these traits? Our differing levels of each trait can account for many of our thinking and behavior differences, and there is a large number of possible combinations. While single standard deviations above or below the mean on any trait are healthy, extreme variances in any of them can cause problems, even personality disorders. The model can help explain why one person prefers to drift from job to job for years, highly open to new experiences and so agreeable that they are happy finding a personally meaningful but low-paying career, while another picks one specialty early in life and conscientiously and neurotically climbs the ranks to early wealth and status. 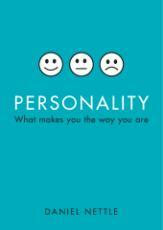 A good introductory book on the Big Five is Daniel Nettle’s Personality: What Makes You The Way You Are (2009). Using molecular, genetic and fMRI techniques, Nettle and other psychologists have found that about half of the variance in our Big Five traits is genetic, and the other half is due to environmental factors that we can influence. I like to think of the half-nature, half-nurture quality of personality traits like this: we can influence all our traits, but our genetics are an evenly-matched opponent, at least at first. We can proactively grapple with that opponent and slowly move our less-desired traits to where we want them to be, “dance the monster,” as my mother liked to say, or we can avoid the fight, be reactive, and let our genetics and the random environments we enter determine our trait levels. It’s our choice. But to make a choice, we should first understand the consequences of our current traits, and ask if those consequences are what we want. If not, we need to know where we want to go as well. What traits fit best with your aspirational self? Whether we choose to grapple or be passive, our traits often have big life consequences. Nettle outlines a famous study by Kelly and Conley, which followed 300 couples over fifty-two years (1935-1987), and found that high levels of neuroticism in either partner was a strong predictor of divorce, and of marital unhappiness for those not divorced. Yet neuroticism in moderation has also been repeatedly correlated, along with conscientiousness, with great producers and managers. The key to outcomes with all our traits is their strength, mix, and the social contexts in which they operate. Let’s consider a brief scenario for the future of trait management. If our accelerating IT capabilities continue as they have, and we get a working conversational interface to the web on our mobile devices in the next decade or so, I can imagine many of us using a digital agent (a “Personal OS” or “Digital Twin”) that helps us assess our traits daily by listening to what we say, and watching what we write and read. Such an agent could guide us into online cognitive behavioral activities and games that measure and help us change our traits, day by day, simply by consciously engaging in activities that support the outcomes we desire. Just as importantly, the emergence of groupnets, tightly connected, sensor-equipped groups of individuals that automatically share rich and nearly 24/7 continuous data (pictures, audio, video, data) about their lives to each other, will bring our current offline support groups, recovery groups, and productivity groups to whole new levels. People in groupnets will be able to watch each other in realtime, review and relive recent events, and even speak words of encouragement into each other’s ears as appropriate. The group will be there for individuals when they’re in need, and these folks will truly begin to see the world through each other’s eyes. Folks looking for help will find it just a voice query away, from someone else in the group. Many types of trait and behavior change work will become significantly more powerful as a result. What cognitive behavioral therapy research has shown to date is that anyone who has cognitive or affective blocks, including mild Asperger’s, OCPD or ADHD, or who feels they have inappropriate levels of any personality trait, can make lasting changes to their mental state with time and practice. What’s more, the better we get at understanding the neural circuits that underlie each of our traits, the better we’ll get at designing activities that affect our scores on those traits, and using the power of cognitive priming (where recent past mental tasks affect our current tasks) and the learning capacity of the human brain. Such daily scoring and practice work can set us on a steady trajectory to where we want to be. I think computing and communications technologies as they move us closer to the conversational interface and the groupnet will truly empower trait change and self-improvement work as never before. To apply the Big Five both personally and in business settings, Nettle’s book above, and Pierce and Jane Howard’s, The Owner’s Manual for Personality at Work (2000) are good basic guides. Howard’s Center for Applied and Cognitive Sciences offers more books and certifications in Big Five testing and application, for those interested in offering it to their teams.